I made this pattern in 2009 for a fund raising. 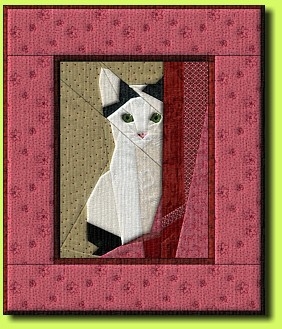 Each participant received this pattern as a thank you for making a quilty donation to the animal protection organization. Now the little tomcat served its purpose. The quilters raised more than 200 cat quilts and a notable donation for the cats in the animal shelter. So this campaign ends for now. A warm Thank You to all participants! Of course the Wee Tomcat pattern stays available.